We had the best Halloween weekend here! JR and I haven’t lived in a neighborhood with Trick-or-Treat-ers in a few years, so we were really looking forward to passing out candy and taking Abby around to a few houses. 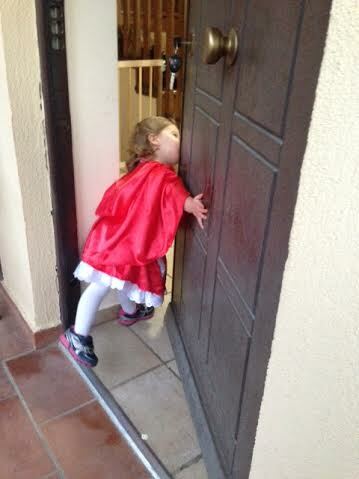 We started the weekend with trick-or-treating at the Embassy. 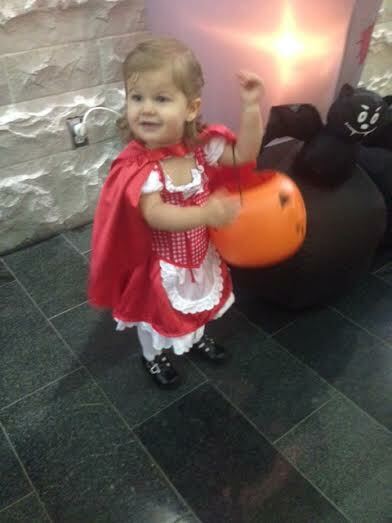 Sopo, our nanny, dropped Abby off in her costume all ready to go with braids in her hair. She does the BEST job with her hair. 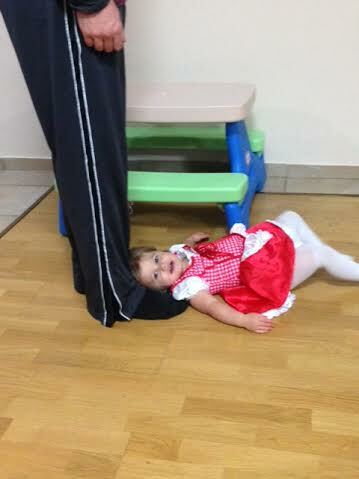 I don’t know what kind of Jedi-mind tricks she uses to make Abby sit still, but I have no such luck! Abby was immediately interested in putting all candy in her mouth, wrappers included. 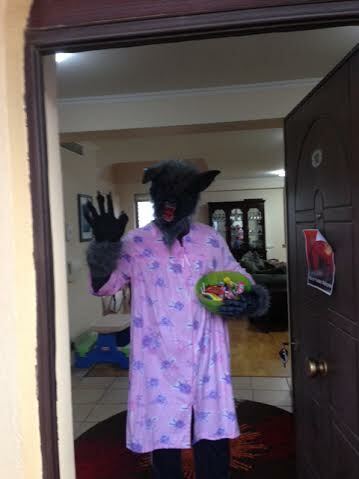 She was displeased when I took the candy away, so in a quick attempt to appease her, I handed her a fun-size Twix. JR was quick to point out that I’d made a huge mistake. Chocolate everywhere. Not a good plan when you a) are carrying your child around in your work clothes and b) need her costume clean again the next day. We didn’t take any pictures of her chocolate-covered face, but once she had her first taste of that sugary goodness, she was hooked. The CLO did an amazing job organizing the event. There were over 150 kids, most offices decorated and passed out candy, and they had games, food, and activities for the kids as well. 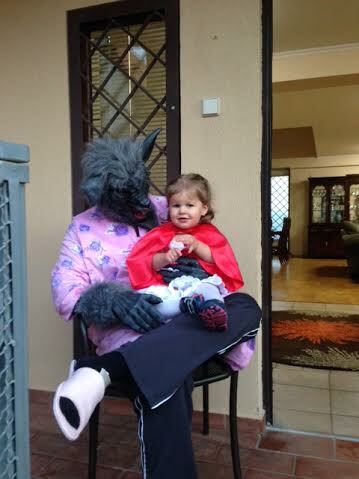 Saturday was the neighborhood trick-or-treat. JR and I had considered a few different costume ideas, ideally something that wouldn’t cost much and was easy. 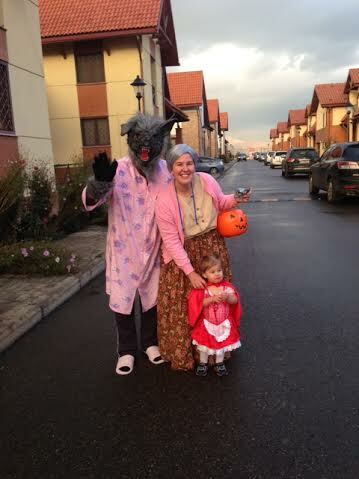 As always, my mom helped with a package that included some granny clothes from Goodwill and a very classy nightgown in a 2XL to help us pull off our family costume: Little Red Riding Hood, her grandma, and the big bad wolf. We realized Abby might be afraid of the wolf mask, so we had it sitting on the counter for a few weeks and occasionally took turns trying it on. She was not into it at first but by the weekend she didn’t seem bothered at all! It was so much fun seeing everyone dressed up and spending time with our friends and their kids. After we passed out candy for a while, we walked down to a friend’s house for snacks and a special Witches Brew beverage while the kids played. When I commented that I didn’t think I Abby received any Reese’s Peanut Butter Cups, my friend E handed me her very last one, stashed in her pocket. That’s true friendship.